I was too sick yesterday when I got home from work. I slept for 5 hours then another 11 hours that I had no time update my blog. 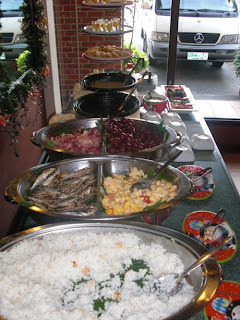 Wednesday morning we had breakfast at Grills and Sizzles at Examiner, Quezon City. That's where I took the couples (friends and their hubbys/bf's) for a breakfast despedida for a friend who is transferring to a new work site. I am just soo glad that they were not disappointed. Php140 is sooo sulit for a breakfast buffet. So what's on the buffet table? Our popular Breakfast Buffet is a spread of bread and butter, garlic rice, salted eggs, scrambled eggs, dried fish, 2 viands for the day, champorado, arrozcaldo, fruit shots and desserts of the day. Viand choices are hungarian sausage, bacon, beef tapa, chicken or pork tocino, longganisa, bangus, tuna. Sweets may include pancakes, churros, maja blanca, biko. Come and start your day right with a hearty breakfast! Breakfast buffet is served from 6:30AM to 10:30AM. Please be at the doors at 6:30AM as the place gets crowded at around 7:00AM!